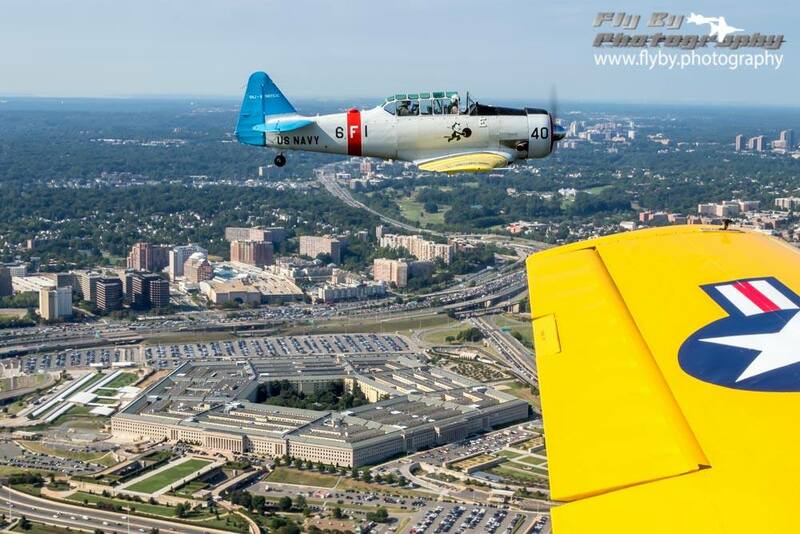 On Sept.7, 2016, four members of the CAF Capital Wing participated in a vintage WWII-era aircraft flyover during the inurnment ceremony for Women Air Force Service Pilot (WASP) Second Lieutenant Elaine D. Harmon at Arlington National Cemetery. 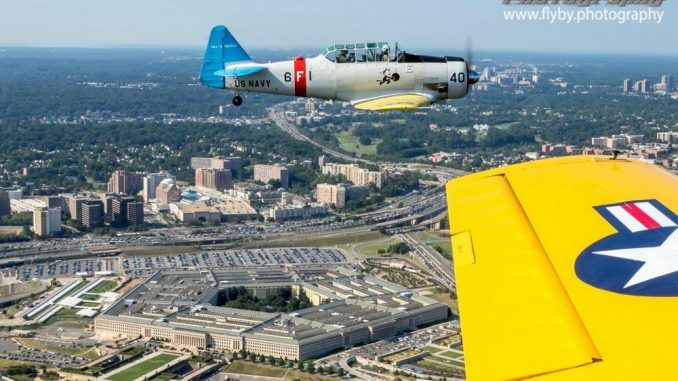 The flyover took place at approximately 10:05 a.m. over Arlington. 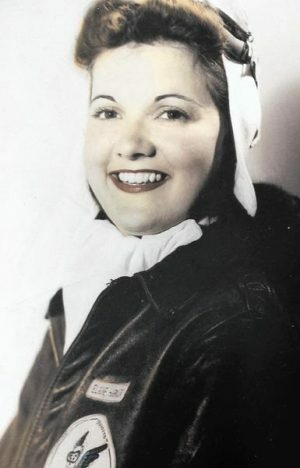 Harmon requested that her ashes be inurned at Arlington National Cemetery, with other WASP. However, former Army Secretary John McHugh ruled in March 2015 that WASP should not be buried at Arlington under then-current law. Harmon’s family spearheaded the effort to reverse the policy, and in early 2016 Senators and members of Congress from both parties introduced legislation to change the law. On May 20, 2016, President Obama signed a bipartisan, bicameral legislation into law that restored burial rights of the WASP, allowing inurnment at Arlington National Cemetery. Harmon, a native of Rockville, Maryland, passed away April 21, 2015 at the age of 95. She trained at Avenger Field in Sweetwater, Texas as a member of WASP class 44-9, and after completing training in November 1944, was stationed at Nellis Air Base, Nevada. During Harmon’s career, she flew the PT-17, BT-13 and AT-6 Texan, and served as co-pilot on the B-17 Flying Fortress. Aircraft accident records indicate that this aircraft was present for duty and suffered a minor mishap on Oct. 13, 1943, with civilian pilot Mr. O.L. Birchfield, a flight instructor, and Constance B. Turner, a WASP Class 43-W-7 Woman Pilot student on board. 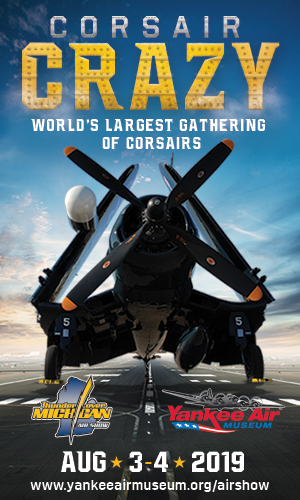 Luckily, damage to the aircraft was slight.North American Aviation later remanufactured the aircraft to T-6G standards at the NAA plant in Downey, California, and assigned it construction number 168-47. Technicians completed the project on May 22, 1950. In the early 1960s the USAF surplused the aircraft, and it entered the civilian registry circa 1963 as N6253C. 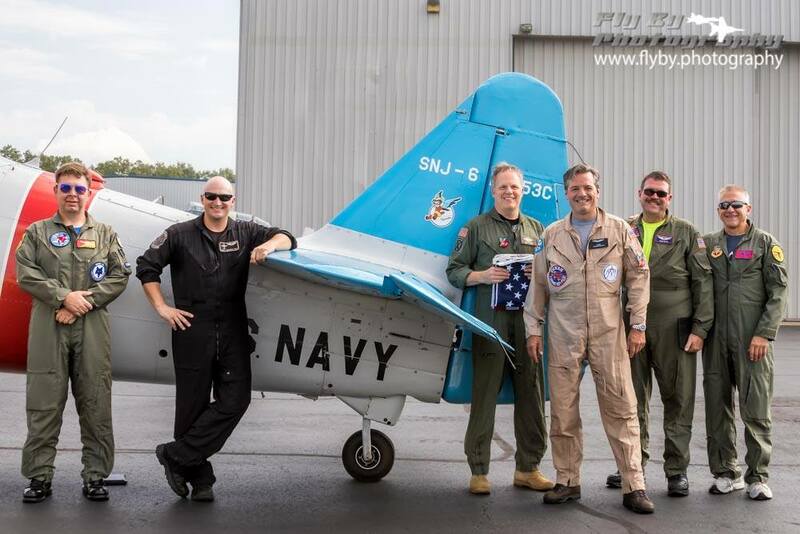 The aircraft is now based at Culpeper Airport, Brandy Station, Virginia. The CAF introduced a new initiative to launch a new educational program, RISE ABOVE: WASP, which will focus on educating young minds of the tremendous acts and braveries of the Women Airforce Service Pilots of WWII. Visit www.riseabovewasp.org for more information about the up-and-coming program.